Axenics offers Computer Numeric Controlled (CNC) pipe bending services for larger bends and for customers requesting high-quantity tube and pipe bending services. We have the ability to work with all of the major alloys, including; copper, brass, aluminum, stainless steel, titanium and Inconel. CNC tube bending provides a more precise, automatic, and repeatable process than manual tube bending. Compared with manual bending, CNC tube bending machines can accurately control the degree of a bend, the distances between bends, and the plane of the bend. CNC tube bending allows for maximum accuracy due to its higher degree of control within the process. This computerized and automated tube bending process makes it possible to perform more complex bending processes than manual bending, and increases overall operational efficiency. Our highly-trained bend technicians are capable of CNC bending a wide range of bend radii. Our experts have many years of experience and knowledge, which allows them to provide the most accurate bends possible. Once complete, all of our bends are leak tested before they leave the facility as a part of our strict ISO quality policy. Axenics uses a dual stack hydraulic tube bender with roll forming capabilities to implement a variety of CNC tube bending services. 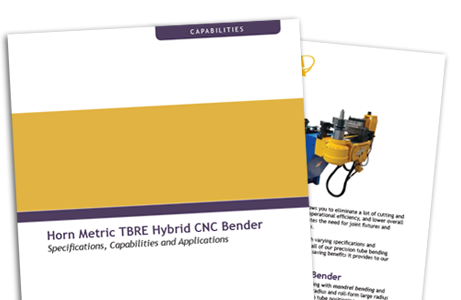 Our CNC bender executes both simple and complex bends of up to 2” diameter tubes. Our CNC tube bender uses the latest software technology and hardware available. A PC based computer system utilizing BendPro software, enables Axenics CNC tube bender to perform difficult sweep bending anywhere along the tube geometry. The possibility of defects in your piping kits is greatly diminished using this method, plus, by not having welds or joints as part of the finished piping, leaks are not a problem. The machine can also perform part simulation and automatic conversion from X.Y.Z. coordinate data (Cartesian coordinates) to Y.B.C. (Bend Program) working datum, or vice versa. STEP and IGIS files can also be imported directly into the control to allow for an easy, one-step process for programming and setup.